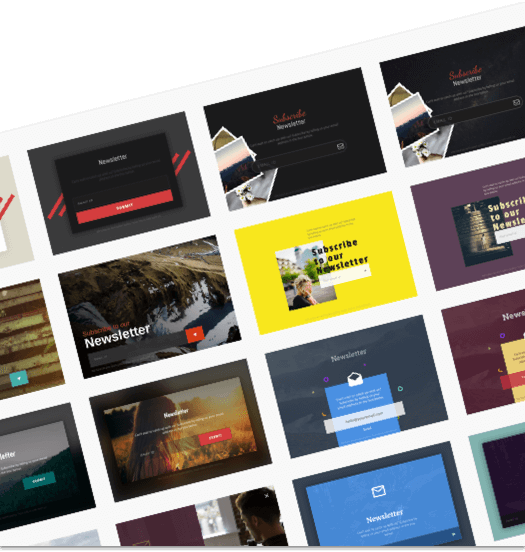 A collection of 16 Signup Layouts kit. You can now use one of these on your website to attract the subscribers to opt-in for your newsletter. Each one is a unique design to fit in different niches, and obviously you can do your changes to make it your own. Design credit goes to CueBlocks Technologies. The Layout Kit is available for Divi & Elementor users. 1) Download zip files from the download link. 2) Import the “Signup_Box_Kit_By_Cakewp.json” file in your divi library and than add it to a test page. This gives you all the 16 layouts. From there you can play & make changes and save one you like in your library to use it. 3) Copy custom css from the “signup_box_kit_css.txt” file provided and paste it in the Theme Options, Again the CSS is for all styles, but you can quickly figure out the one you need from the comments in css file so you may need to remove extra style’s css once you finalize the one you need to use. The form in this layout kit is created with “Contact Form 7” plugin for demo you can use it and use an add-on to integrate it to Mailchimp, if you like to use any other plugin instead i am sure it will work quite good with the css already provided but you will ultimately need to make some adjustments yourself depending on what plugin / code you use for the subscribe form. In the Download you will find 3 files. 1) Import the “signup_box_kit_by_cakewp.json” file in your Template library and than add it to a test page. This gives you all the 16 layouts. From there you can play & make changes and save one you like in your library to use it. 2) Copy custom css from the “signup_box_kit_css.txt” file provided and paste it in your Theme Options / or child theme, Again the CSS is for all styles, but you can quickly figure out the one you need from the comments in css file so you may need to remove extra style’s css once you finalize the one you need to use. 3) “forms_signupboxkit.xml” contains all the forms i have created using “CF7” plugin for demo, you can import this via Tools > import but make sure you have installed & activated the Contact form 7 plugin first. For any issue please reach to me with specific details and i would try to respond as soon possible.